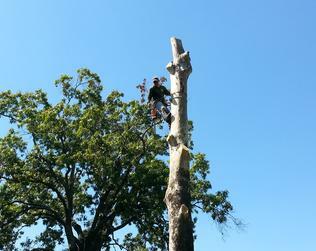 Tree removal is a very dangerous task and should only be performed by professionals with years of experience. 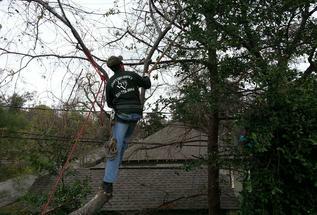 When a potential problem involving a tree damaged or diseased beyond repair is present, tree removal may be required. Tree removals always present a challenge and safety and quality is always our number one priority. Trees in neighborhoods often are surrounded by other landscapes or valuable structures; therefore the removal must be conducted in a careful and controlled manner. Dismantling a tree requires a highly trained team of individuals with experience and skills to utilize state-of-the-art machinery to ensure your safety and the protection of your home and property. At Texans Tree Service we care about your wellbeing and we put our experience to work and take care of the most difficult removals and give you peace of mind. At Texans Tree Service, we take care to provide our customers high quality services personalized for their unique needs. We are available to take your calls 7 days a week. Our staff members are professional, courteous and efficient. Having trees that are well maintained is important in preserving the beauty of your property and the health of the trees. Careful pruning and trimming can both extend the life and ameliorate any presented threats. Such efforts can also greatly enhance both the essential functionality and esthetic qualities of the treated specimens. Pruning and trimming trees can be dangerous work and we take good care in providing safety first for everyone including the surrounding plantings, properties, buildings, and vehicles while providing the best work quality. Tree Pruning involves the selective removal of parts of a tree, such as branches, buds, or roots. Reasons to prune trees include deadwood removal, thinning the crown for air flow and sunlight, shaping, improving and maintaining health, reduce risk from falling branches, and both harvesting and increasing the yield or quality of flowers and fruits. Tree trimming involves a preventive maintenance program that cuts back tree to prevent branches from damaging properties, nearby trees, clearing walkways or blowing into overhead lines causing power outages. Pruning and trimming trees requires the use or powerful and dangerous equipment, knowledge and skills of where and how to make a cut and experience and professionalism required to care for your trees. Have a plan when hiring a tree service company. Always ask how long they have been in business and what their skills are, what equipment will be utilize, ask for proof of liability insurance for you protection and written invoices. Stump removal is always recommended after a tree removal or if you have tree stumps on you property, you may want to get them removed professionally. We have the tools and skills required to get the job done efficiently and safely. 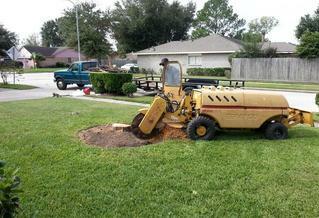 Removing tree stumps will enhance the beauty to your landscape and give you more valuable space. Stumps can attract over 100 types of pests that can later infest your healthy trees, plants and your home. We grind all stumps twelve inches below grade, cover the area with top soil making it ready for sod and clean all debris. If you are planting a tree, we recommend the area to be grinded deeper and wider, or the tree can be planted a good distance from the former stump area to ensure proper root development. We offer a wide variety of tree care services. We are professionals and enjoy what we do. We are fully licensed and insured for your protection and your satisfaction is always 100% guaranteed. Do not hesitate to contact us today for a free evaluation and estimate of all your tree care needs.